How to cook black beans in the slow cooker (crock pot) and on the stove top. Dried beans are easy and healthier than store-bought canned beans, plus making them at home saves money! 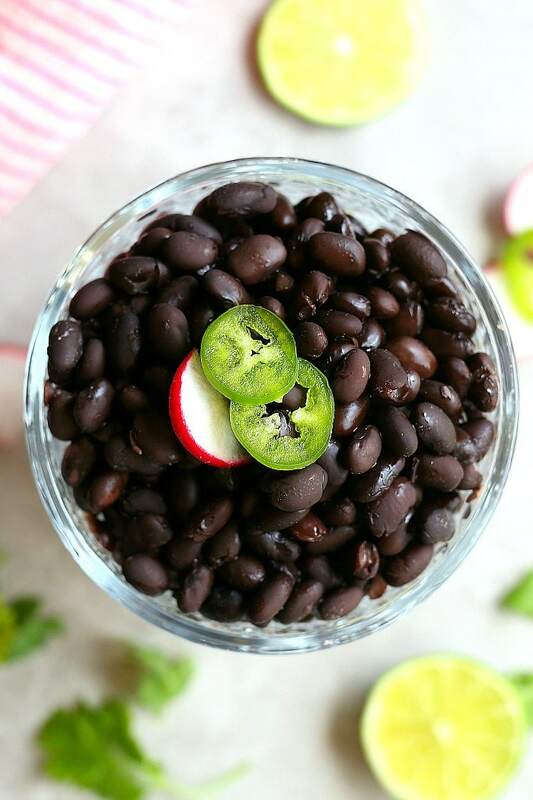 This easy black bean recipe is perfect to add to simple family-style sheet pan nachos, vegetarian fajita burrito bowls, Mexican stuffed sweet potatoes and black bean brownies! There are two great ways how to cook black beans without having to open up a can: in the slow cooker and on the stove. Making beans at home from dried black beans can be just as convenient as using a can in the pantry. It just requires planning ahead a little. Dried beans are quite simple to cook and not only will it save money in the long run, it does not contain Bisphenole A (BPA), a chemical in plastics and the lining of cans that is a concern for health. 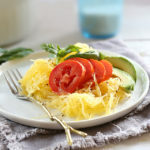 The recipe is freezable so you can make a large batch and store it in small quantities in the freezer! This is convenient especially if you or your family does not eat a large batch at once! 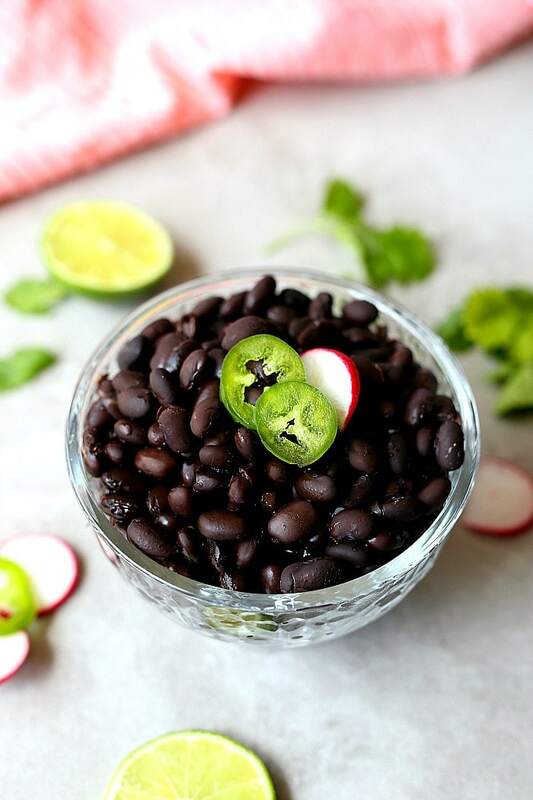 Cinco de Mayo is right around the corner and I promise you we will be enjoying some delicious Mexican food and these killer cooked black beans! Most nights Big C and little C ask for bean and cheese burritos for dinner. The Mr. has told me for years that he could eat a burrito every night of the week and would not get sick of them. I love that because bean burritos can actually be healthy and gluten-free when made at home without extra preservatives, salt and oils. I make them from scratch in a large batch and store some in the freezer in mini baggies to grab each week. Cooked beans do not last long – only 3 to 5 days – so this method works for us so no food goes to waste. This week I was all excited to come home late in the evening from soccer practice with a quick meal to make when I noticed the beans in the fridge were spoiled. How to tell? If they have a smell when the container is opened then they are done. It is also apparent if there are splits in the beans with that slight smell. Now let’s chat “how to make black beans” – but first the WHY? SAVES MONEY! Organic beans at the store are about $1.69 for 15 ounces. But if you make them at home, freeze some in small batches and use them as needed. It saves a bundle over time! It adds up, trust me. SAVES HEALTH! There are no metals from cans, BPA chemicals, extra salt or preservatives when dried black beans are cooked from scratch. Make sure there is always LOTS of water. Add salt after the beans are cooked or it will slow down the cooking process. To make fresh cooked beans from dried beans first soak the beans for 4-6 hours or overnight. This helps to soften the beans and reduce cooking time. Then add about 2 cups of the beans to the slow cooker and fill it with enough water to fully cover the beans, about 8 cups of water. Now cover and walk away! Let the slow cooker do the work! Cook the beans for about 6 hours on low and make sure it always has water in it. Again make sure to soak the beans for 4-6 hours or overnight. In a large pot add about 2 cups of dried beans. Add enough water to cover the beans 2-3 inches above them. Cover and boil on medium-high heat then turn the heat down to a simmer. Simmer covered for about 1-3 hours. Simmering helps to keep the beans together and prevent them from getting squishy. Check to see if the beans are tender after 1 hour as it may take up to 3 hours. For both methods of cooking when the beans are done cooking drain and rinse with water. Optional to add some flavors like salt, cumin and garlic powder. It is also optional to add a bay leaf in the pot right before cooking. Cooked black beans will stay fresh for 3-5 days. 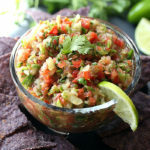 More black bean recipes you may enjoy! I hope my “how to cook black beans” tips have been helpful and you make them! 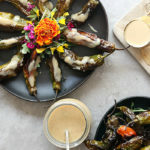 If you do, don’t forget to share your creations with me on social media @delightfulmomfood and tag me #delightfulmomfood. I love to see what you are cooking up! How to cook black beans in the slow cooker and on the stove top. Soak the beans for 4-6 hours or overnight. This helps to soften the beans and reduce cooking time. Then add about 2 cups of the beans to the slow cooker and fill it with enough water to fully cover the beans, about 8 cups of water. Cover and cook on low for about 6 hours or until the beans are soft. Make sure there is always water in the slow cooker. When they are finished cooking drain and rinse the beans. Store in an airtight container for 3-5 days. Soak the beans for 4-6 hours or overnight. In a large pot add about 2 cups of dried beans. Add enough water to cover the beans about 2-3 inches above them. Cover and boil on medium-high heat then turn the heat down to a simmer. Simmer covered for about 1-3 hours. Simmering helps to keep the beans together and prevent them from getting squishy. Check to see if the beans are tender after 1 hour as it may take up to 3 hours. Make sure there is always water in the pot. When they are finished cooking drain and rinse the beans. Store in an airtight container for 3-5 days. Add some salt and flavors like cumin and garlic powder. It is also optional to add a bay leaf in the slow cooker or pot during cooking.